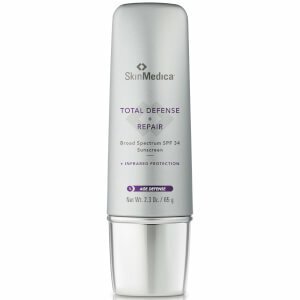 SkinMedica's Total Defense + Repair® is a rejuvenating superscreen with an advanced antioxidant complex proven to prevent premature aging from chronic exposure to infrared. It provides comprehensive protection beyond UVA and UVB while supporting the skin's ability to restore itself. Apply liberally 15 minutes before sun exposure. Reapply at least every 2 hours and after towel drying, swimming, or sweating to avoid lowering protection. Sun Protection measures UV exposure from the sun increases the risk of skin cancer, premature skin aging and other skin damage. To decrease this risk, regularly use a sunscreen with a broad spectrum SPF of 15 or higher and other sun protection measures including limiting time in the sun from 10 a.m.-2 p.m., and wearing protective clothing. Children under 6 months: Ask a doctor. Inactive ingredients: Water, Caprylic/Capric Triglyceride, Squalane, Silica, Glycerin, Niacinamide, Dimethicone, Glyceryl Stearate, PEG-100 Stearate, Cetearyl Alcohol, Butyrospermum Parkii (Shea) Butter, Polygonum Aviculare Extract, Physalis Angulata Extract, Dunaliella Salina Extract, Ubiquinone, Camellia Sinensis Leaf Extract, Tremella Fuciformis Sporocarp Extract, Betaine, Melanin, Tocopheryl Acetate, Tocopherol, Hydroxyacetophenone, Batyl Alcohol, C12-15 Alkyl Benzoate, PEG-12 Dimethicone, Panthenol, Butylene Glycol, Ceteareth-20, Polyhydroxystearic Acid, Isostearic Acid, Xanthan Gum, Ethylhexylglycerin, Disodium EDTA, Aminomethyl Propanol, Caprylyl Glycol, Potassium Sorbate, Sorbic Acid, Phenoxyethanol, Iron Oxides (77491, 77492, 77499). I wasn't a fan of this sunscreen. I was looking for something to replace my Elta MD tinted sunscreen since I found out that product contained petrolatum. The tinted aspect of this was too chalky and not moisturizing enough for me. It left streaks on my face, particularly around my eyes and eyebrows. It's dense with color, more like a liquid makeup rather than "tinted". I use it with a little regular sunscreen and a primer, mix them together in my palm and apply. It's wonderful! My skin is looking better since starting this regime about six months ago. I recommend it, sunscreen and treatment together in one product. Yay!